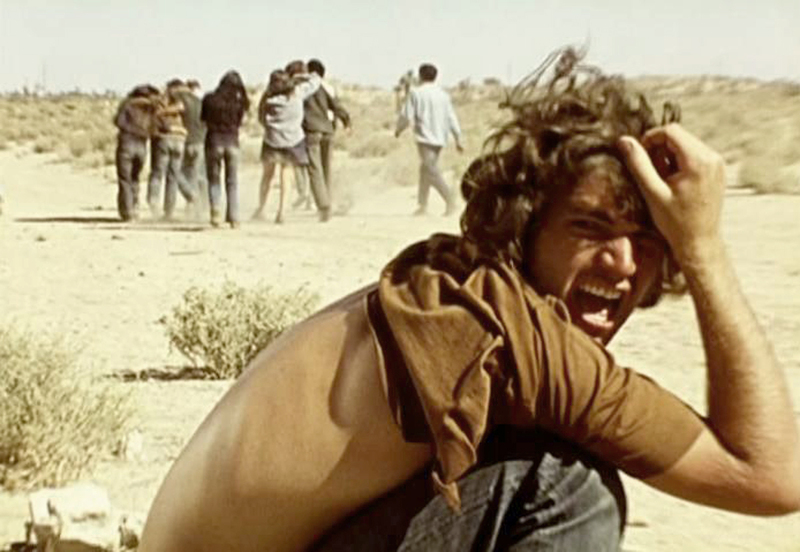 In Punishment Park, participants are left without food and water to fend for themselves in the brutally hot California desert. British filmmaker Peter Watkins was preparing to leave the United States in 1970, after spending months writing a documentary about the civil war he knew would never be filmed, when four students at Kent State University were killed by police open firing on a Vietnam war demonstration. The shooting was a turning point in the making of his most controversial film, Punishment Park. The pseudo-documentary takes place in 1970, 20 years after the Internal Security Act has been put in place. The law allows the government to immediately apprehend anyone they consider to be a threat to national security. Those targeted include draft dodgers, artists and political agitators. Instead of a trial by jury, the accused are put before a tribunal, which already sees them as guilty. The accused are then given a choice: serve a long prison sentence or spend three days in Punishment Park. Watkins follows two groups, one on trial and one already serving time in Punishment Park. Once in the park, participants must reach an American flag 53 miles into the desert within three days while evading the authorities to win their freedom. The dissidents fracture into three groups; the militants, semi-militants and pacifists. The film charts their progress, and shows even peace-loving people will resort to violence if placed in a life-or-death situation. Watkins has stopped giving interviews about his films. In an email to the Concordian, he wrote this was “basically due to the obvious lack of interest within my profession to challenge the media crisis, or to discuss this essential aspect of my work.” For decades, Watkins has been speaking out against what he calls the Monoform, an established narrative and format that TV and cinema uses to communicate their message. Punishment Park is terrifying because it’s so convincing â€“ if you weren’t told it was a pseudo-documentary, you would think it was real. Watkins’ use of non-professional actors really pays off. No one sounds like they’re reading lines; every single dialogue is immediate and urgent. At the tribunal, accused and accusers shout at each other in a tense political frenzy. In fact, according Watkins’ 2005 self-interview, most of the dialogue was improvised. “In the film you have two categories of ‘performance’: those who were expressing their own opinions, and those who opposed their own personal convictions – who were role playing, if you like,” he explained. Watkins’ film remains little-known, seldom screened and almost undistributed. Its original run in New York City was only four days long. “The Hollywood studios refused to distribute the film, for fear – as they frankly told us – of retribution from the federal authorities,” he said. Whether you like it or not, Punishment Park is sure to get a reaction, which is exactly what Watkins wanted. “Punishment Park takes place tomorrow, yesterday or five years from now,” he wrote in a 1972 open letter to the press. In his self-interview, Watkins stated, “What remains most important about Punishment Park, in my own opinion, is that the film allows young people the possibility to express themselves, freely and with force, within the framework of an important social metaphor.” Even 40 years after its release, Punishment Park remains shocking and frightening. Punishment Park will be screened at Cinema Politica on Feb. 21. For more information, check out cinemapolitica.org.